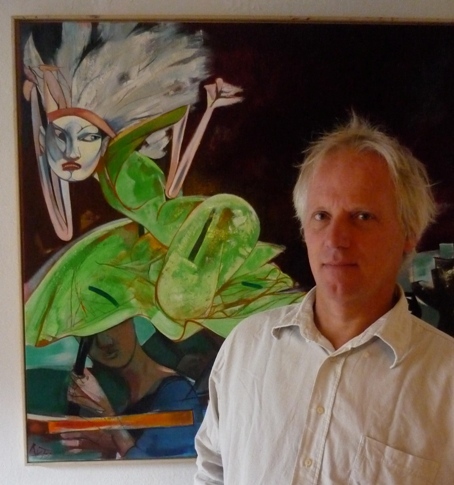 In 1958 René van Tol was born in Amsterdam. From 1976-1979 he studied art history at the Free University in Amsterdam. From 1979-1981 he studied graphic design at the Royal Academy in Den Bosch, the Netherlands and from 1981-1983 he studied painting and graphic design at the Rietveld Academy in Amsterdam. Since 1983 he is a professional artist, working in his studio and for the Dutch Puppet Theatre in Amsterdam. 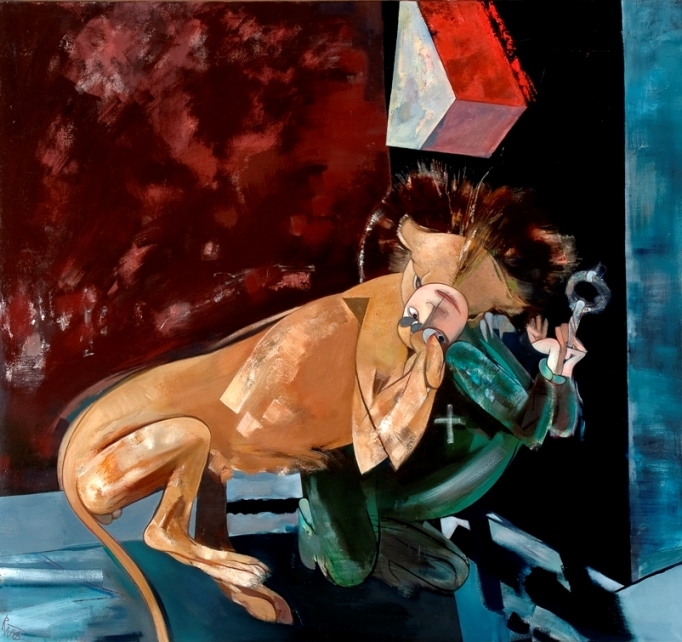 He also creates work inspired by the Bible and the Christian tradition. In 2004 this resulted in a commission for a mural in the Obrecht Church in Amsterdam depicting the Annunciation. In 2009 the Museum Catherijneconvent for religious art in Utrecht bought nine of his works. René van Tol’s work is strongly influenced by Catholic theology, in particular the concept of the Trinity. The dogma of the Trinity connects the transcendental with the immanent, the eternal with the temporal. The eternal God who is outside time is also within time, the incarnated God, in other words Christ. The Spirit is the connecting element between these two. These three theological concepts can easily be applied to the visual arts, as in art we also deal with two opposite elements: abstract, timeless form language and figurations which are perceived in time with their spatial properties. These two fertilize each other. It is this fertilization that causes the same to be perceived as new. In his interest in the interplay between the abstract-timeless and material-physical elements René van Tol stands within the tradition of West European art. This means that in his religious art the physical element plays an important part. As God has taken on a body, the physical is important. Hence Van Tol’s work is not purely spiritual. The terms religious and spiritual to him are not identical. That is why his work is consciously figurative. The spiritual element in his work is that which prevents his figurations from being reduced to a mechanical reproduction of the perceived world. More about his ideas can be read on his website, especially in his essay ‘The Elements of Art’. At this moment Christianity plays the role of scapegoat in our society. This means that in many circles, especially in the art scene, Christianity is regarded as taboo. A taboo forbids and condemns. It creates a myth that something is pernicious and contaminated. René van Tol tries attempts to make the beauty of Christian thought and the Christian tradition visible in his work. He tries to show that Christian thought is the foundation of our culture. For that reason the themes he uses are always based on existing examples. In the history of Western art the same themes have been portrayed over and over again. René van Tol ties in with this tradition. Often his works are therefore remakes of existing paintings. 1. 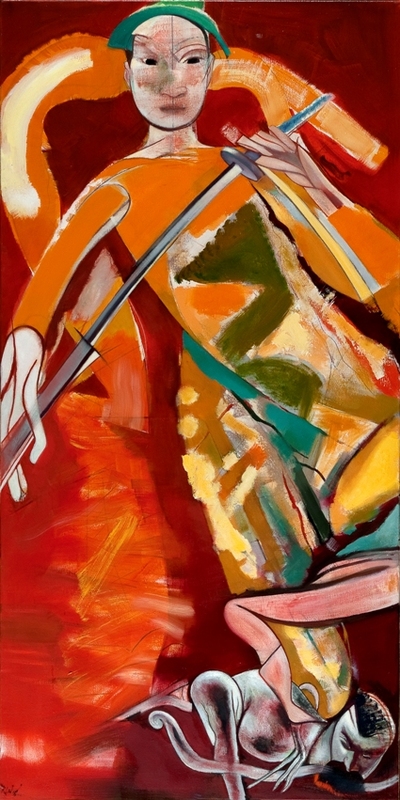 Crucifixion, 190 x 70 cm, oil. In this painting I wanted to express the abandonment of Christ; stabbed by the lance and surrounded by a very dark nature. 2. St. Michael and Nietzsche, 160 x 80 cm. Nietzsche to me is the essence of a modern philosopher, the philosopher who rejects Christianity in its totality. This painting expresses the conflict of our time: that between morality and unlimited self-expression. 3. Martyr, 150 x 160 cm, oil. A Christian martyr, who submits himself to natural violence and does not resist. 4. 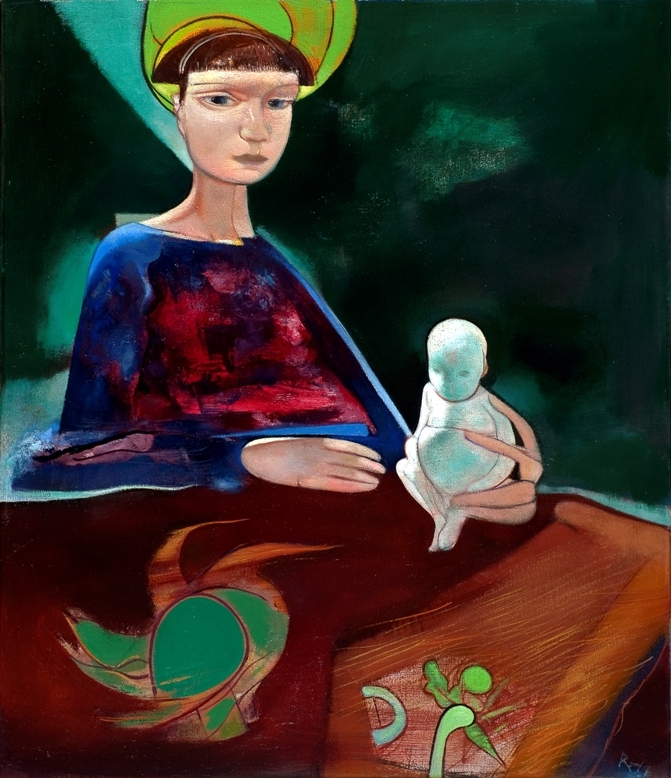 Madonna, 73 x 56 cm, oil. Christian art mainly consists for me in making ‘remakes’, the use of already existing themes and subjects. With my madonnas I tie in with the endless series of madonnas that have been made in history, a centuries-long variation on a theme. This ‘varying’ prevents us from too personal religious expressions and connects us to the religious realm of thought of our ancestors and to the Christian community of all times. 5. 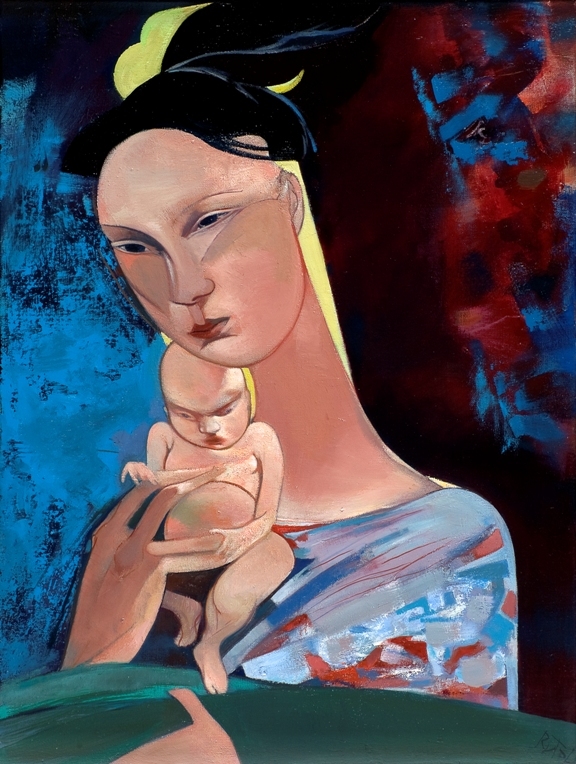 Madonna, 70 x 60 cm, oil.